Discover the rich Renaissance beauty of Mantua (Mantova), a UNESCO World Heritage site located beside three lakes. On this full-day guided tour, take a train ride from Milan to this delightful city in northern Italy that locals call ‘Sleeping Beauty,’ then cruise down the Mincio river to enjoy the fairytale skyline of turrets and cupolas, and sweeping views of green landscapes. 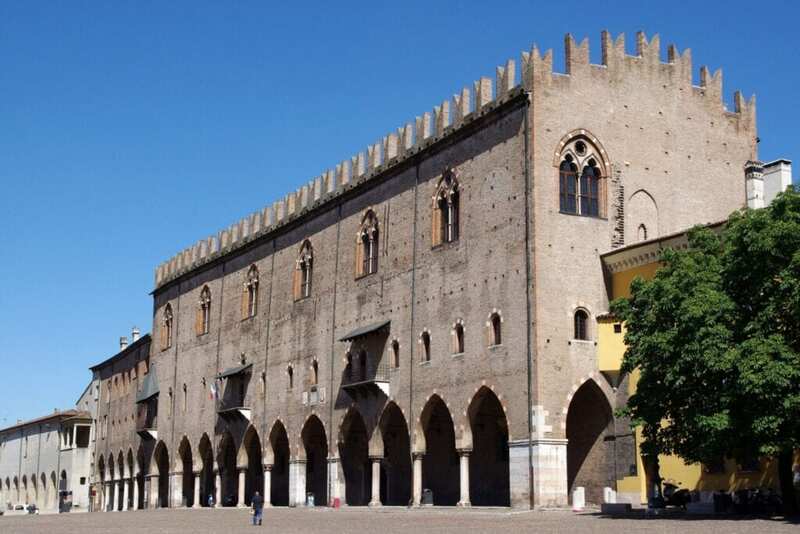 Wander through Mantua’s cobbled squares and visit the fabulous Palazzo Ducale, former home of the Gonzaga family, the largest residence in Italy after the Vatican. Meet your tour guide in the morning at Milan’s central train station. Board a train and travel east for about two hours to reach Mantua, aka Mantova, located in the Lombardy region of Italy. Arrive at the historical center of Mantua for an introductory walking tour that lasts about an hour. Settled by the Etruscans in the 10th century, the city rose in prominence in the 14th century under the reign of the Gonzaga family, one of Italy’s most influential Renaissance families. During their 400-year reign, the notable family of art patrons attracted the likes of Andrea Mantegna, Sir Peter Paul Rubens, and Giulio Romano to Mantua. Wander through Mantua’s charming cobblestoned piazzas with impressive Renaissance architecture, and up and down narrow winding streets with medieval buildings. Then board a ferry and relax during the 1.5-hour journey of the artificial lakes, built in the 12th century as a defense system, that surround Mantua. You’ll also cruise down the calm Mincio river for scenes that seem untouched by time: gorgeous pastoral panoramas and a city skyline of towers and domes, turrets and cupolas. After the ferry returns to Mantua, you have 90 minutes of free time to have lunch (own expense) and explore. You can savor pasta in the lively Piazza delle Erbe or check out Piazza Broletto’s monument to the poet Virgil, who was born just outside of the city. Then head over to the Palazzo Ducale, the 34,000-square-foot (3,159-square-meter) palace from where the Gonzaga family ruled the city. During your two hours here, note the frescoes, gilt ceilings and Flemish tapestries. As you make your way through the rooms, admire Renaissance masterpieces of art, including Mantegna’s Camera degli Sposi in the Bridal Chamber and Rubens’ Adoration of the Magi in the Room of Archers. Visit the nearby Cathedral of St. Peter to admire its Carrara marble façade constructed in the 18th century. In the late afternoon, return to the train station and arrive back in Milan in the evening.